John Akiba and Tesuya Ishida – the MVPs of the match. Score – 12 – 38 (L). The Tokyo Crusaders headed out to Chiba to face off with Ishikawa Rush for the second season in a row. This year the weather was thankfully better than the minus 5 and pouring with rain that we had last year, and our team manager had also made the clever decision not to book a ski trip on the same weekend with half of our players out of action! This time come kick off, with no ski trip scheduled or other excuses we still only had the bare minimum, only Trav and Tooley on the bench! We said welcome back to Chris Ford, a Tokyo Crusader from way back who joined us for this game and who normally plays Scrum Half who stepped up to the plate and slotted into the front row to play prop for the very first time! He says helping to run the US Sevens in Las Vegas he had lots of experience at hookers, so he should be fine in the front row! 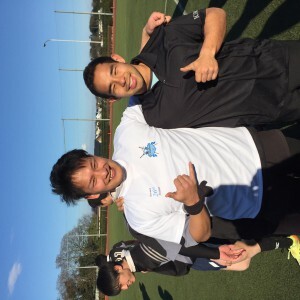 Also another welcome back to Alex Herrera after a long stint abroad who is back in Japan with the Cru. Coming off a 40-0 thrashing last year vs Ichikawa, who are supplemented on big game days with the lads from Superman, we knew the opposition would be a tough outfit and from the off the Rush put us under a lot of pressure winning turnover ball at the ruck and getting quick ball out to their backs. In a tight first half, the Cru battled away after a quick start by Ichikawa with a good try to Lukas but were still down by 2 tries at half time. In the second half the scrum (with our #9 doing a sterling job at loose-head) was one of our highlights as the rest of the play was poor, with handling errors, silly turnovers and regular penalties handing too much possession and territory to a skilful, well-drilled and aggressive Ichikawa team. Our defense did its best to hold out the opposition for as long as it could and did well to only concede the 6 tries in total, bagging a breakaway try to John Akiba out-wide who looks a classy player and one to watch in future games. The final score was 38-12 to Ichikawa, closer than last year, but still a disappointing result. Hopefully with a fully fit and full strength roster the Crusaders can give a better account of ourselves next year and make it a bit more competitive. Hats off to the first time players who made their debuts for the Cru this week, Yahye, Genta, Moses and John – all had storming games and showed glimpses of what is to come from them. The points went to John Akiba, who had a fine game playing in the centres and on the flank just ahead of our new Fijian recruit Moses and Rob, who was consistent as ever in the forwards.